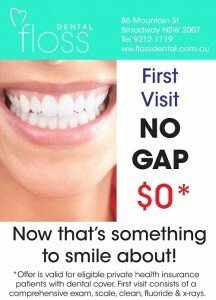 No-Gap Check up & Clean for new patients! *Offer is for a full comprehensive check-up, digital bitewing X-rays, OPG Xray and clean, and is valid for new patients only. Minimum healthfund rebate of $290 otherwise Gap payment applies. Must bring healthfund card to claim on the day otherwise offer is not valid. To book, please call Floss Dental, your Medibank preferred Broadway Dentist on (02) 9212 7119.